These dog bandanas are hand cut from rescued T-Shirts. Available in many different colors and there's even a discounted 3-pack! Alex Eaves "The ReUse Life"
Show your support of the reuse movement and STAY VOCAL creator, Alex Eaves. This T-Shirt pays homage to our home state of Massachusetts. It's available on black, green, navy blue and red T-Shirts. The California version of our classic REUSE! Because You Can't Recycle The Planet. T-Shirt featuring the state shape.. 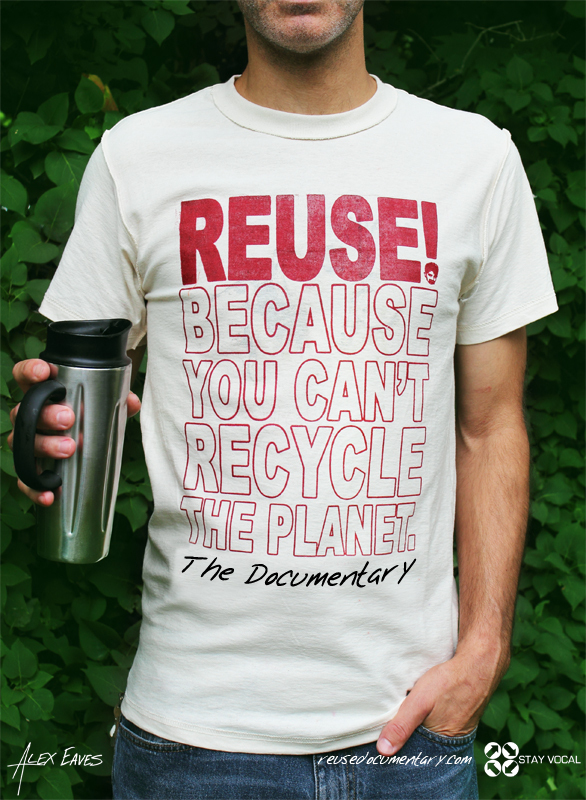 The official T-Shirt of the REUSE! Documentary. The Massachusetts version of our classic REUSE! Because You Can't Recycle The Planet. T-Shirt featuring the state shape. The Minnesota version of our classic REUSE! Because You Can't Recycle The Planet. T-Shirt featuring the state shape. The New York version of our classic REUSE! Because You Can't Recycle The Planet. T-Shirt featuring the state shape. The Virginia version of our classic REUSE! Because You Can't Recycle The Planet. T-Shirt featuring the state shape. 1 $20 Gift Certificate, 1 Digital download of the REUSE! Documentary to be sent to any email address. 1 REUSE! T-Shirt, 3 REUSE! Patches, Digital download of the REUSE! Documentary upon release. These are free. You just pay the postage. The Minnesota version of our classic REUSE! Because You Can't Recycle The Planet. design featuring the state shape.